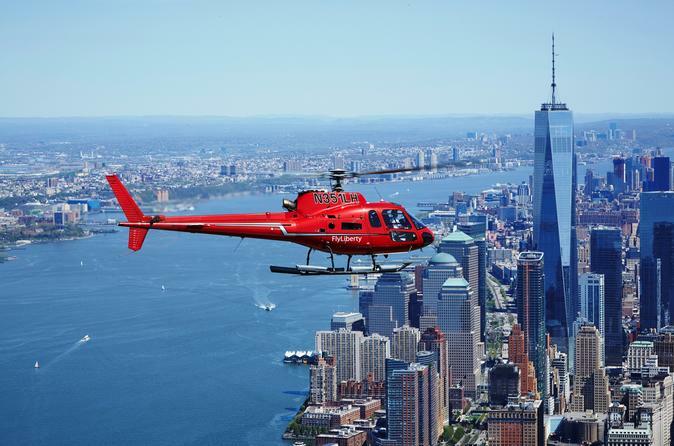 Enjoy sweeping views of Brooklyn, New York City and New Jersey skylines as you soar past some of the most iconic landmarks known throughout the world on your own private helicopter. You'll have an opportunity to talk to the pilot before your flight who will customize a route tailored to your preferences. Upon your arrival to the heliport in Downtown Manhattan, you and your group will discuss the sights you'd like to see from the sky. The pilot will design a custom charter flight specially for you! You'll get a birds-eye-view of the Statue of Liberty, Governors Island, Ellis Island and the new One World Trade Center. See famous NYC bridges including the Brooklyn Bridge, the Manhattan Bridge, the Verrazano Bridge and Coney Island. View NYC’s skyscrapers like the Empire State Building, the Woolworth, the Chrysler and the MetLife Buildings. Make your way up the Hudson River past the USS Intrepid, Central Park, Grant’s Tomb and the Palisades of New Jersey and then fly right over the George Washington Bridge. Catch a glimpse of Yankee Stadium and MetLife Stadium where Super Bowl XL, VII was played. Enjoy the skyline of New Jersey’s Weehawken, Hoboken and Jersey City! You'll land in Midtown Manhattan feeling accomplished and in awe of all the wonder NYC has to offer. This unique aerial experience will be the highlight of your trip!